Evergreens are a constant factor in any landscape design, providing color and retaining their needles throughout the year creating winter interest! They also provide screens, wind blocks and can be planted as specimens in the landscape. An evergreen is a tree that keeps it’s needles all year long. 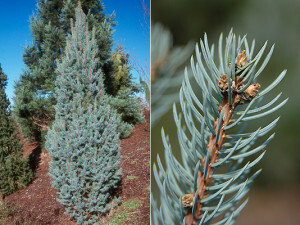 There are many varieties of evergreens. 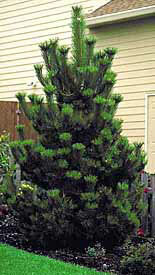 Some examples of evergreens are Black Hills Spruce, Colorado Spruce, Austrian Pine, White Pine, and more. Fast growing pine with beautiful open growth. than other pines. Plant in a protected area. adapts to a wide range of conditions. vibrant blue foliage, intensifying with age. 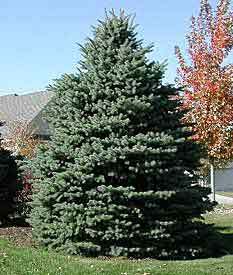 more slender than Colorado Blue Spruce. compact, dense habit and bright to dark green. then matures into a large, formal specimen. areas that you don’t want a tree 60’ tall. Nice! stiff branches with sharp needles. point where space is a consideration. Full sun. Cones are attractive as Christmas ornaments. 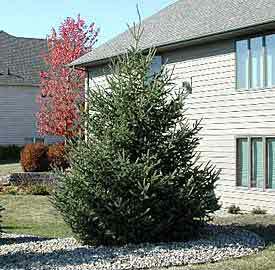 make this variety an elegant, dramatic conifer in the landscape! for the modern landscape. Best in full sun.